Rabbi Natan Levy is the Head of Operations for Faiths Forum for London. He received his rabbinical ordination (yore yore) in 2006 from Rabbi Brovender and Rabbi Riskin in Yeshivat Ha’Mivtar, Israel. Natan was environmental liaison to the former Chief Rabbi, Lord Sacks, the interfaith Consultant to the Board of Deputies of British Jews from 2013 to 2017, and a University Chaplain to Bristol University. 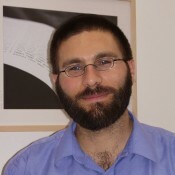 Natan is the co-author of “Sharing Eden: Green Teachings from Jews, Christians and Muslims.” He holds a Bachelor of Arts in Comparative Religion from Pomona College, a Master of Arts in Jewish Studies from King’s College, London, and is pursuing a doctorate in environmental theology at Bristol University. His research interests include: crosscurrents between ecology and faith, interfaith grassroots movements in the UK, Europe, and the Middle East, and dialectical encounters in comparative scripture. Rabbi Levy teaches Rabbinic Literature & Guided Text Study in Midrashic topics at the College.